Windmill Software is delighted to launch their Enhanced Windmill software suite. Enhanced Windmill includes human machine interface software, data logging, charting, output control, programming tools, alarm monitoring and drivers for instruments communicating over Ethernet, Internet, USB, Modbus, RS232, RS422, RS485 and TCP/IP. Enhanced Windmill runs under Windows 8 and earlier versions of Windows. The package is available for just £295 and we include free technical support for life. The human machine interface software, called Graphics, makes it extremely quick and easy you to create virtual instruments, process mimics, annunciator panels, wiring diagrams or any display you choose. Windmill Logger includes alarm indication, logging to a new data file at regular intervals, logging only when new data arrives and many other options. All logged data is time stamped and data can be sent to Excel and other programs in real-time. 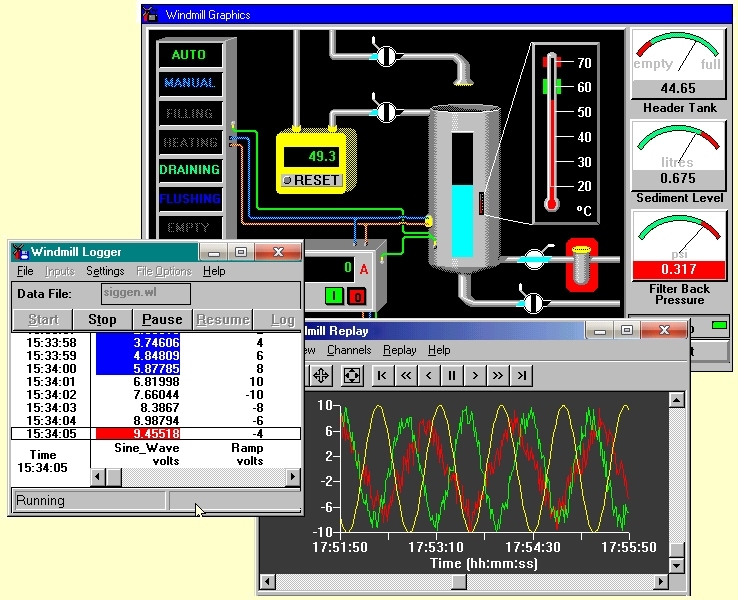 Other programs in Enhanced Windmill include charting, data replay and sequence control. Enhanced Windmill is produced by Windmill Software Ltd, a British company established 1991. We specialise in data acquisition and control systems using Windows software.